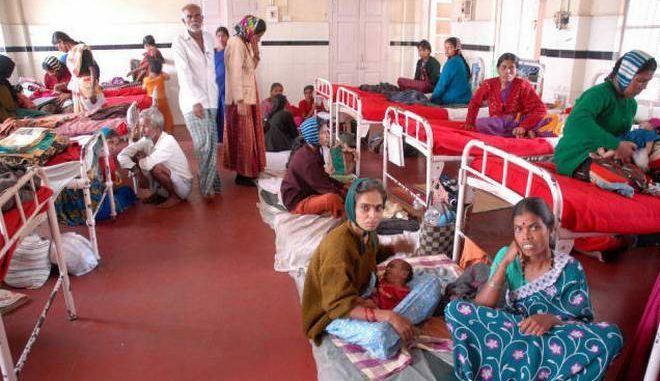 The clinical trial environment in India has seen a downward trend since 2013, when the government approached the Supreme Court regarding the death of 2,644 volunteers during clinical trials over seven years. At that time, the Supreme Court of India halted 162 trials from global pharma companies and asked the drug controller general of India to provide details on the mechanism adopted to approve the trials.This prompted the Indian government to prolong the online review process with added liability for sponsors and restrictions on trial numbers per investigator and required site sizes. From then on, the view of India as a destination for low-cost Phase II to III trials with a large treatment-naive patient pool changed. Looking into the trial numbers after these changes, a sharp decline in industry-sponsored trials were observed between 2013 and 2015. Figure 1 below shows the trials registered in India between 2013 and 2016. Overall there was a reduction in Phase I to IV trials by 30 to 35 percent. The most impacted were the Phase I to II trials, which fall under the early-phase clinical trial spend. 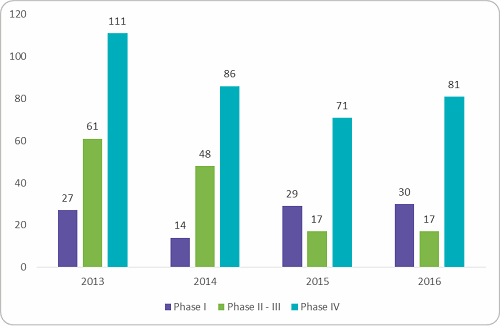 Figure 2 below shows the reduction in early-phase trials conducted between 2013 and 2016. There was a dip of 52 percent after 2013. The reason behind the dip was the ban of first-in-human trials after multiple trial failures and stringent regulations from the government to stop illegal trials. Another problem global pharma companies have faced is the series of government decisions on intellectual property and pricing of drugs in India. Indian laws and court rulings in some cases have made it easier for generic rivals to sell lower-cost, copycat versions of global pharma medicines. Table 1 below shows the patent wars in India since 2013. In some cases, the court has ruled in favor of the global pharma company, but some did lose their patents to generic manufacturers. To protect their patents in India, global pharma companies started partnering with local pharma companies. They used co-marketing, which provides global pharma with additional marketing reach into the interiors of the country with a lower-priced generic brand. Such generic drugs are reviewed by the committee under “compulsory licenses,” which allow local companies to produce a patented product without the consent of the patent owner. The owner still owns the rights and receives payment for its use. 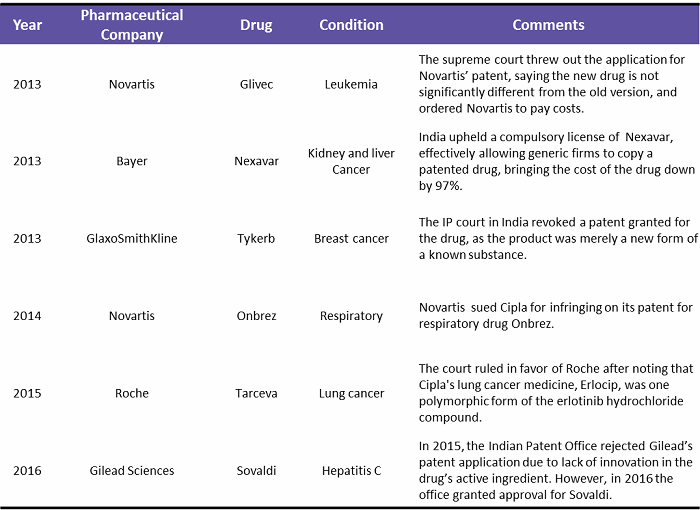 The compulsory licensing provision and the authority to control drug prices provides Indian drug authorities adequate power to control the patentee’s monopoly. In the long run, any dilution of the patentee’s rights will be counterproductive, as they would begin to question if India is an attractive low-cost research destination. In 2013, India saw an overwhelming number of trials allegedly causing deaths and serious adverse events (SAEs). Following this, the Supreme Court directed the government to amend the regulatory framework to ensure patient safety. Increased patient safety, SAE reporting, and a better compensation framework were the areas targeted for improvement. Table 2 below highlights some of the key regulatory concerns addressed over the 2013–2015 period in India. The regulatory framework in India was improved based on extensive input from sponsors, CROs, and investigators and information from previous experiences. To sum up, currently all clinical trial applications (CTAs) must be submitted online, followed by review of a Subject Expert Committee (SEC), a Technical Committee, and an Apex Committee. Major factors assessed are risk versus benefits to patients, innovation or existing therapeutic choice, and if the drug fulfills unmet medical needs in India. 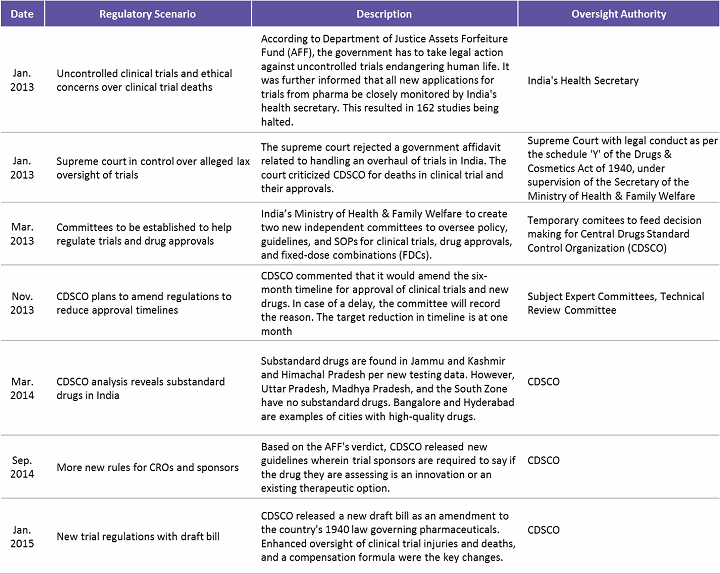 Table 3 below lists the key regulatory reforms and impact areas for sponsors running a successful clinical trial in India. 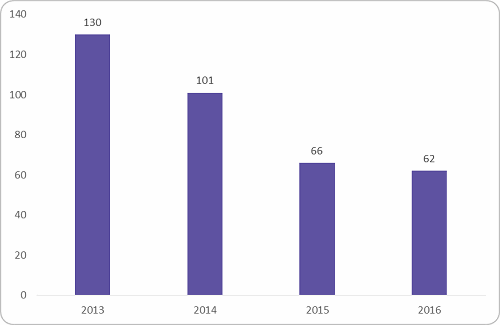 The period of 2013 through 2015 saw a major setback in India, with a reduction in trials conducted as a result of several allegations. From 2016 onward, there have been slow signs of revival, with Phase IV trials seeing an increase by 10 to 14 percent from 2015. Pharmacovigilance, health economics and outcomes research (HEOR), clinical data management, biostatistics, and IT services are some of the key categories where India is still a preferred offshore destination, considering the skill sets, cost efficiency, and ease of doing business. The recent regulatory reforms in India call for a fresh start for trial sponsors. With all amendments aimed at reduction in approval time and increased harmonization, India could recover and become a favorable, patient-friendly destination for clinical trials in the coming years. Of course, this is only achievable with continuous monitoring and further regulations aimed at safeguarding patient interests and easing trial conduct through harmonization and global standards. Mathini Ilancheran is the principal analyst of healthcare R&D for Beroe Inc. She specializes in understanding market scenarios and industry dynamics across the globe in the outsourcing arena. She has written for several publications related to R&D procurement opportunities. With her category knowledge, she has published more than 17 articles in leading journals, co-authored with industry experts. She completed her master’s in management from University College London (UCL) and has worked as a consultant for strategic positioning projects as part of UCL advances in the U.K. You can contact her at mailto:mathini.ilancheran@beroe-inc.com or connect with her on LinkedIn.